It's no secret we're advocates of smaller teams, but it's always nice when others agree. Baseline's Tony Kontzer leveraged some of our most recent data for an informative slideshow about team size. At one time or another, almost all information technology professionals have heard cries for more resources. They may even have been the one asking for help. "If only there were more people available for this project," they've said, "then maybe it would get done on time." Well, it turns out that more staffing is not the equivalent of optimal staffing. 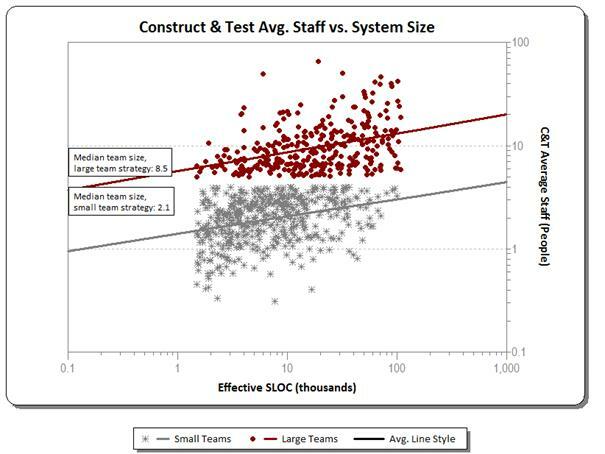 In fact, smaller project teams are more productive and can complete projects cheaper and faster than larger ones, according to a recent study from software life cycle consultancy Quantitative Software Management. That should be good news for IT departments that have seen their ranks depleted in recent years. 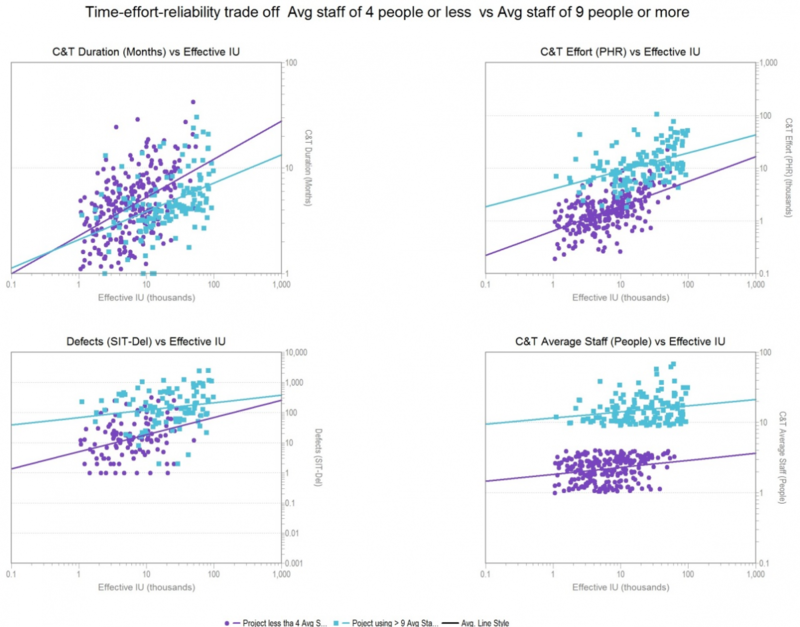 To see more results from QSM's recent study, read Don Beckett's post on the correlation between staffing and schedule. I should be the last one to complain about overstaffed projects; I may owe my career to one. My first job in information technology (IT) was with a mortgage company that was a textbook example of bad practices. Annual personnel turnover was 90% and after six months on the job, I was the person on the IT staff with the most seniority. After a year, I knew it was time to go. I applied for a job with a large systems integrator that was hiring furiously. I was drug free, did not have a criminal record, and knew COBOL, so I was a perfect match. The project to which I was assigned had planned to ramp up to a peak staff of 25 and last about 8 months. I was team member number 60 of the 80 it eventually grew into by the time it completed (in 18 months). I stayed with that company for a number of years and have no complaints about the wide range of experiences that I had and skills I gained. What is the best way to determine how much staff a software project should have? QSM has conducted a productivity study on projects sized in Function Points that suggests a way. A large sample of projects (over 2,000) was split into size bins. Within each bin the projects were divided into quartiles based on their staffing. The average and median productivity (Function Points per Person Month) were determined for each quartile. The following table compares productivity and staffing levels for the smallest and largest staffing quartiles. Read more about Staff That Project!